Daisy flowers are a versatile variety to grow in the garden to complement other blooms. The solitary flower of the daisy bears single, semi-double or double flower heads. The smooth leaves form a rosette shape to hold up the bright bloom. Daisies are often used as ground covers for their carpeting form and tucked into containers for vibrancy. English daisy (Bellis perennis) is a perennial but best grown as a biennial in the South and an annual throughout the rest of the United States. 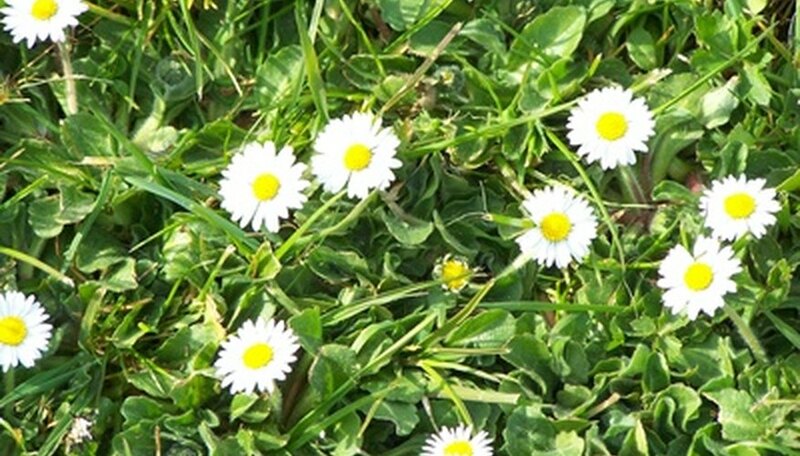 English daisy has white daisy-like petals and a bright yellow center. Growing less than 6 inches tall and 6-to-12 inches wide, English daisies work well tucked along a garden walkway for their low-growing ability. They have a moderate growth rate and flower form that comes in single, semi-double or double. The spoon-shaped leaves on English daisies are smooth and form a rosette shape. Blooming in summer, English daisies require full sun to part shade to thrive. Grow English daisies in other areas of the garden by dividing the plants in early spring. Plant English daisies in USDA Hardiness Zones 4 to 8. Becky Shasta daisy (Leucanthemum × superbum 'Becky') is a perennial daisy variety with large white blooms and clumping growth habit. Growing 3-to-6 feet tall and 1-to-3 feet wide, Becky Shasta daisies are ideal grown in masses along a flower bed or border. Moderate growers, they have strong, upright stems to hold the large flower heads. Blooming later than most daisy varieties, Becky Shasta daisies are a summer staple in the garden. The masses of white flowers make a perfect cut flower and also attract butterflies. To promote a long flowering season, deadhead the spent blooms as soon as they are noticeable. Becky Shasta daisies require full sun to part shade and well-drained, moist soil. Plant in zones 5 to 8. Blackfoot daisy (Melampodium leucanthum) is a perennial shrub with a moderate growth rate and clumping habit. Growing 1-to-3 feet tall and wide, the upright mounds of bushy foliage bears white daisy-like flowers. The foliage on blackfoot daisies is lance-shaped. Honey-scented, the flowers are a good choice to plant along a rock garden or border. Blackfoot daisies require full sun and well-drained soils to thrive. Plant in zones 4 to 11. What Flowers Are in Season in June? What Flowers Are Blooming in July?